Several things determine your Google language: the country you picked when you signed up for Google, the country from which you are using some Google products (like Gmail), and the Google website you are using. 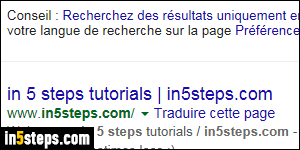 Example: if you are in the US, but you go to google.fr, the page will be written in French (google.ca -Canada- gives you the choice). Same with google.es - everything will be in Spanish. And any search result in that language will be prioritized. 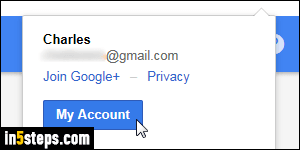 Once logged into your Google account, click on your username (top right corner of the page) and click on the blue My Account button. Under Account preferences on the right, click on the "Language & Input" Tools link. Click "Select language" on the next page, and "Select a language" on the pointless interstitial page that follows. Either find in the popup the language you want to use, or type its name in the text box to quickly filter. Note that the listing is sorted alphabetically, but each language name is written in its own tongue, not in English - type "Español" for Spanish, not "Spanish", in other words. Next, select the variant (if any) for the language you picked. In most cases, you won't notice much difference, but it ensures that wherever applicable, Google will use the appropriate regionalisms. 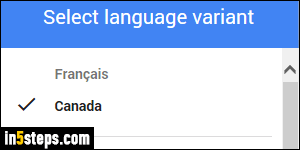 As soon as you click on the language variant, the popup closes, and Google is now in the language you picked! 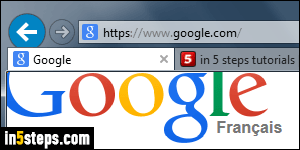 If you didn't already have the localized version of Google search in your web browser, you will see a popup at the top offering to add Google search in that language so that you can search from your web browser's address bar or search box. Click OK (or whatever :) to accept, otherwise ignore the message. 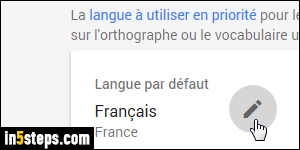 Notice the URL on the screenshot: Google is now in French, even if I'm on google.com, which is the search engine's homepage for the United States!